Pragati Group of Institutions, Kalahandi has advertised in the Sambad newspaper for recruitment of Teaching Faculty- Principal, PGT, TGT jobs vacancies. Interested and eligible job aspirants are requested to apply with in 7 days. Check out further more details below. 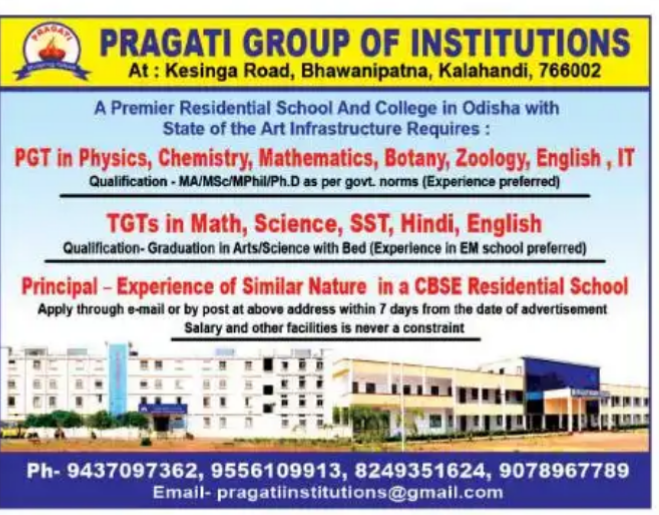 Name of the School : Pragati Group of Institutions, Kalahandi. 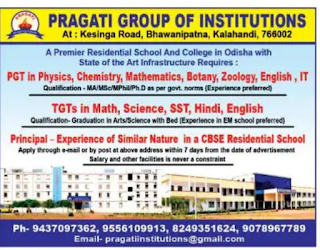 About School: Pragati +2 Science College, a golden feather of Pragati Group of Educational Institutions , has made an indelible mark in the realm of education not only in Kalahandi but also in whole Odisha. Principal : Experience of similar nature in a CBSE residential school. PGT:M.A,M.Sc, M.Phil,PhD as per Govt norms. (experience preferred). TGT:Graduation in Arts and Science with B.Ed(experience in EM school preferred). Reference: Recruitment Notification / Career Job Opportunities notice for Teaching Faculty PGT, TGT, Principal on Sambad newspaper Dated 2nd July 2018.